Happy International Day of Forests!! Although we didn’t really need an excuse to talk about forest conservation, the fact that today is dedicated to forests seemed like a good opportunity to remind everyone why forests are so incredibly important! Why are forests so important you ask? Well there are many reasons ranging from habitat protection to climate change. One of the most important global contributions a forest can provide, is their ability to absorb and store carbon. Trees use energy from the sun and carbon dioxide from our atmosphere to produce carbohydrates and oxygen through the process of photosynthesis. This carbon stays bound up in the trunks, roots, leaves, and soils for years. Tropical forests store 30% of all the global carbon, and the Osa Peninsula has the highest carbon storage observed in the NeoTropics! Trees significantly help offset climate change and global warming. Since trees are major carbon sinks, they contribute to the storage of excess CO2 entering our atmosphere from the burning of greenhouse gasses. However, deforestation accounts for 12 to 20 percent of the global greenhouse gas emissions that are contributing to climate change. Forests provide habitats for almost half of the world’s species! 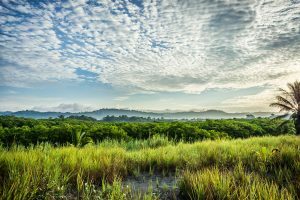 The heavily forested Osa Peninsula is one of the most biodiverse places on Earth, harboring 2.5% of the biodiversity of the entire planet in less than a thousandth of a percent of its total surface area. 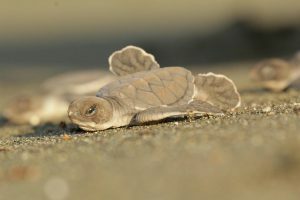 However, due to deforestation and loss of habitat, many of these species, including jaguars, leatherback turtles, and manatees, could possibly go extinct. Trees are also an important part of the water cycle. By helping slow runoff and allowing water to filter into the soil, they can preserve groundwater supplies that are important both to people as drinking water and to fish and other aquatic life in nearby streams. During times of heavy rainfall, lowland forests such as those in floodplains help to absorb water and slow flood flows, preventing damage to soil, property and buildings. And last but certainly not least, trees and forests are sources of beauty and symbols of life. According to a poll by The Nature Conservancy, more than 90 percent of Americans report that trees give them a feeling of peace and tranquility.